There is absolutely nothing wrong about this one kilometer long beach. It is easy to access despite being lined with multiple resorts and other establishments. The resorts also work together to keep the beach clean for their guests, which is a bonus. The water is shallow and the surf is negligible thanks to an offshore reef. It’s not too crowded, which makes it a great place to sunbathe. It’s truly magical in the morning, at sunrise, as the beach faces east. There are restaurants for food and drink. It’s a good beach for a stroll. How popular is Mengiat Beach? People normally club together Nyaman Gallery and Gunung Payung Beach while planning their visit to Mengiat Beach. My definitely go-to beach for swimming! Yes it can be crowded with people but this beach has a long line so you can have your own space to swim. Just pay 2k for bike parking and enter the beach. Usually I go to the left side where I can just put my beach towel on sand, and the sea current on the left side is calmer than the right side so it is easier to swim. Beautiful clean beach. The water was sparkling. Cafes and amenities nearby. Not many hawkers. Beautiful tranquil beach setting. Nowhere near as busy as the western side beaches. Clean sand and a gentle shore break with easy access to amenities. If you are looking for serenity, then Mengiat Beach is the place. Worst beach in Bukit area. Tonns of trash and rubbish in water and in the sand. Despite beautiful water color - awful swimming experience due to floating bottles and etc. Even Geger beach is much better. 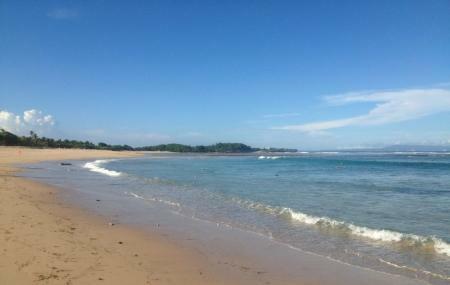 But better spend some time and money and visit Pandawa or Melasti beaches.